This is one of four butterfly bushes in our yard. It is another one of the plants that we like in our garden. They grow large with showy flowers and require little, if any, care. 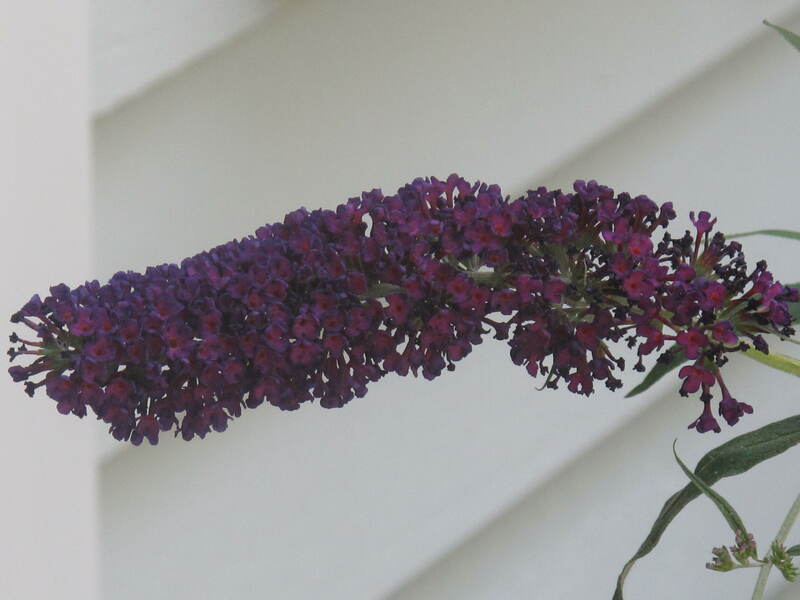 Other than an occassional pruning, the butterfly bush is self-sufficient. 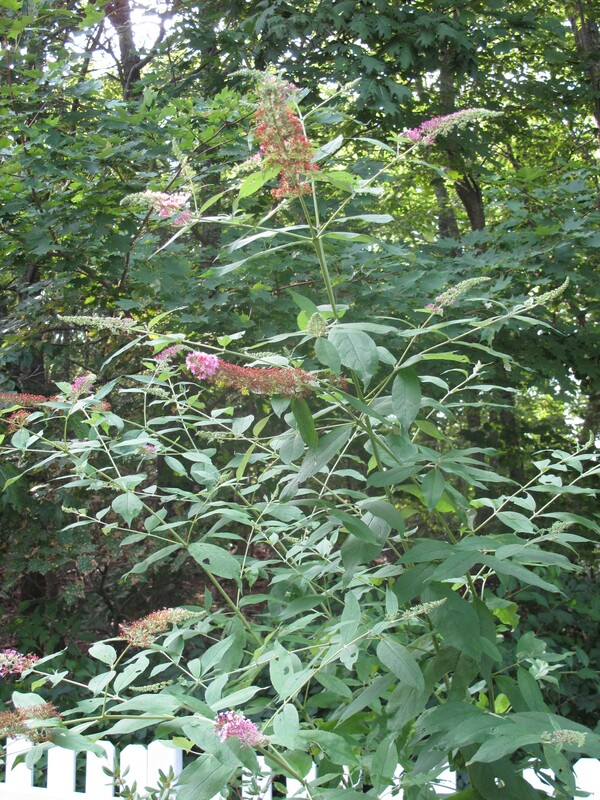 With a name like butterfly bush, you might expect a plant to be attractive to butterflies. In fact, it’s more than attractive; it’s a magnet for all the butterflies who pass through your garden seeking nectar. Many butterfly gardeners plan their garden around Buddleia (pronounced BUD-lee-ah), a genus that includes over 100 species and cultivars. Also called summer lilac, the medium to large-sized shrubs can anchor a perennial bed or form a hedge. With a little help from the internet, here is some more information about the beautiful butterfly bush. 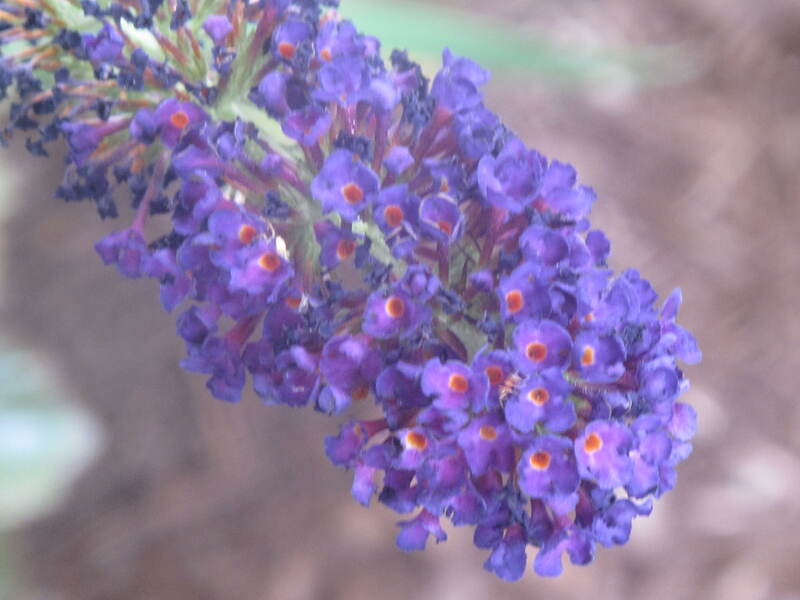 You’ll be happier with Buddleia if you accept its growth habit, which is not neat and tidy. 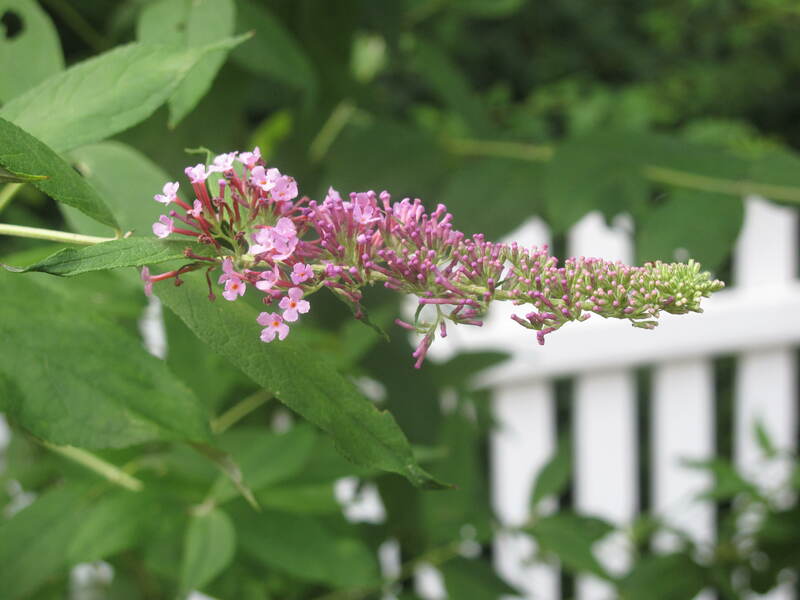 Its narrow branches support lilac-like clusters of blossoms a foot or two in length, with side branches and blossoms. After a rainfall, the flower-laden branches of some species can droop all over your flower bed. You’ll want to allow at least six feet between bushes to keep some semblance of neatness. But wait until you see the bush covered with butterflies! You can see large and small butterflies land to sip from the many individual blooms. Butterflies and bees will flock to the honey-scented blossoms, whose dilute nectar is sweetest in mid-day sun. Near a path or patio, the shrub provides delightful fragrance for you, too. 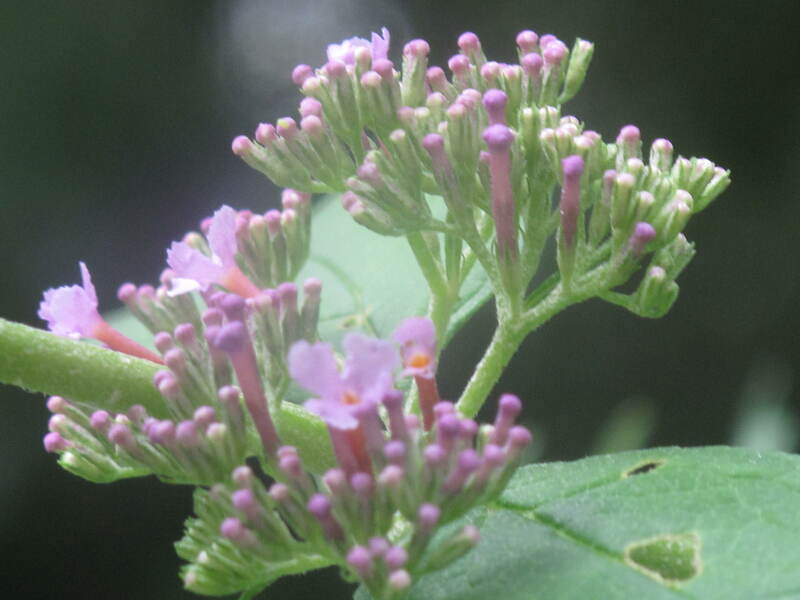 Where did the name Buddleia come from? A seventeenth-century amateur botanist named Reverend Adam Buddle was honored posthumously, when the first butterfly bush reached England in 1774. Victorian-era explorers brought all kinds of exotic plants back to England. From China came seeds of Buddleia davidii, the hardy species that is most familiar to gardeners today. Named after a French Jesuit missionary, Pere Armand David, B. davidii reached London’s Kew Gardens in 1896. Another reason for Buddleia’s popularity is that it’s easy to grow, even hard to kill. Buddleia davidii tolerates urban pollution and alkaline soil. It’s generally pest-free, except for spider mite infestations during drought or stress. A plant that can take care of itself is great for any gardener. Couple this with the butterfly bush’s great beauty and you have an all around winner. These are must haves for any butterfly enthusiast. When in bloom, there is rarely a time that you walk by and don’t see a flurry of gorgeous butterflies enjoying this plant. They are a great addition to any garden in need of a large tree-like bush. Go buy one. What plants in your garden are your favorites? This entry was posted in The Garden-2011 and tagged Acorns, Blog, Fun, Gardening, Life, Lifestyle, Love, My Life, Nature, Photos, Summer, Thoughts. Bookmark the permalink. We don’t have anything pretty in our garden, except rosemary. But our favorites are always edible anyway. Tomatoes are pretty right! Hi Katherine. Yes, tomatoes are pretty….just a little smelly when you pick them to put into a vase 🙂 Hope you are doing well…come back and visit us soon. Wow those are cool. We have “fairy wand” and “kangaroo paw” among other things adding color and height in our backyard. Flowers are just so nice! Hi. Your plants sound great. I’ll have to look them up as I’ve never heard of them. Take care and come back and visit soon.